SUMMARY Exchange rate and currency unification is a high priority. Estimates from the national income accounts place the average managed rate at about 3 Cuban pesos per dollar in 2012-2016. Unification is made difficult by the feeble international reserve position of Cuba with assets covering only about one-fifth of the monetary base of the prospective single currency. International assets rose in 2017, yet it is unlikely that Cuba will have a convertible currency in the near future. The Cuban government has firmly stated since 2013 its desire to achieve monetary and rate unification of its two currencies, the peso (CUP) and the convertible peso (CUC). [ii] In a speech to the National Assembly on December 21, 2017 Raul Castro once more stressed the importance of monetary unification. [iii] So this is taken to mean that soon there will be progress in this area although previous pronouncements regarding the urgency of policy action have been disappointing. In this note I present tentative calculations regarding monetary and exchange rate unification. At present the exchange rates for private individuals against the US dollar are CUP 24 = $1 and CUC 1 = $1. In general state enterprises carry out foreign trade at an exchange rate of CUP 1 = $1 though this has been adjusted for many state companies to a higher rate. [iv] Full unification implies the elimination of the CUC and establishment of a single exchange rate of the peso against the dollar. Cuban national income accounts (NIA) are denominated in CUP. A rate of CUP 1 = CUC 1 is used for CUC accounts at state and private entities. Foreign trade is converted into pesos at CUP 1 = $1. It is possible to obtain an average exchange rate from the data published by the Oficina Nacional de Estadistica e Informacion (ONEI). [v] This is not the effective exchange rate used in transactions but a rate to convert CUP-denominated GDP into dollars and an initial point of reference in gaging the future of peso unification. The calculation involves basic national income accounting. The aggregate expenditures identity GDP (Y) is equal to the sum of its components, household consumption (C), investment (I) and government consumption expenditure (G) plus net exports of goods and services (X-M). Consumption provided by the private sector (CP) is domestic in origin. This is reasonable since cuentapropistas offer services with few or no imported inputs. The other private component of consumption are farmers’ markets which also have few or no imported inputs. Where e1 and e2 are the two official exchange rates so that e1 corresponds to CUP 1 = $1 and e2 to CUP 1 = $0.042. Please remember that cuentapropistas and agro markets expressed as CP transact in CUCs and so are valued in dollars at rate e1. Table 1 shows the resulting values of the average GDP exchange rate expressed as 1/e, that is in pesos per dollar. Accounting values for the CUP and CUC were CUP 24 = $1 and CUC 1 = $1 for all years except 2010 when CUC .93 = $1 before it reverted to parity the following year. The calculation shows the NIA imply an average exchange rate between CUP 2.82 and CUP 3.21 per dollar in 2010-2015. In a recent study Pavel Vidal using an alternative calculation estimates an accounting exchange rate for 2010-2014 of CUP 2.38 as against the average estimate here of CUP 2.87. [vii] Vidal values consumption in the state sector at CUP 1 = $1 and consumption in private firms at CUP 24 = $1. In addition, Vidal does not take into account investment expenditure and exports of goods and services. His calculation is centered on consumption while the exercise here focuses on obtaining an exchange rate for GDP in its totality. The rate e is the average exchange rate that applies to GDP. It is the average exchange rate for overall expenditures in the economy. It can be called the average managed exchange rate as its dual components, e1 and e2 are set by the government. Dual exchange rates with a spread between CUP and CUC of 2300% point to the difficulty in arriving at an equilibrium rate of exchange. There is a CUC/dollar black market in Cuba which is said to vary within a 5% discount of the after-tax dollar rate available in exchange houses (CADECA). [viii] This marginal market suggests relative stability of the official CUP 24 = CUC 1 = $1 possibly with some intervention by Cuban monetary authorities. Monetary analysis is useful to gage the viability of a market-set unified rate. [ix] This involves analyzing international reserves and foreign currency flows in relation to the money stock. A first step in this process is to compare the monetary base to international reserves. Since there are no published data series of either variable estimates need to be made from related data and summary balance sheets of the Central Bank of Cuba. Cuban assets at banks reporting to the Bank for International Settlement (BIS) are used as an estimate of gross international reserves. 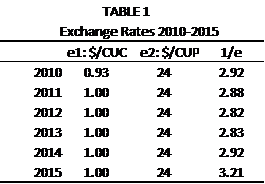 Table 2 shows the coverage ratio of the combined monetary base for 2010-2016 at the average exchange rates in Table 1. [xiii] It also shows the full coverage exchange rate. This is the exchange rate needed to cover the combined monetary base with dollar assets available at BIS banks. Full coverage means that the Central Bank has sufficient assets to convert the money supply into foreign currency thus potentially quelling a surge in demand for dollars. This is theoretical. Private citizens including, god forbid, hedge funds hold only small sums of peso currency assets, and there are no peso bonds in private hands. Given this and exchange controls, a speculative attack on the peso is unlikely. On the other hand Cuba has unknown foreign currency liabilities to foreign exporters that press its international reserves. Cuba could manage with less extensive reserve coverage in case flexible exchange rates are adopted after currency unification. This could be a freely floating currency or some other arrangement such as periodic foreign exchange auctions. Even in that situation robust foreign currency assets would allow the central bank greater ability to conduct monetary policy and help stabilize the currency if need be. Table 2 places some perspective on the delays in Cuba’s exchange rate and monetary unification. The coverage ratio declined from 0.8 in 2010 to 0.15 in 2016. It looks as if Cuba might have considered currency and exchange rate unification in 2010 as it accumulated foreign assets. As these assets dwindled from $5.4 billion to $2.0 billion at the end of 2016 prospects for successful currency unification looked rather feeble. There is some good news in 2017. 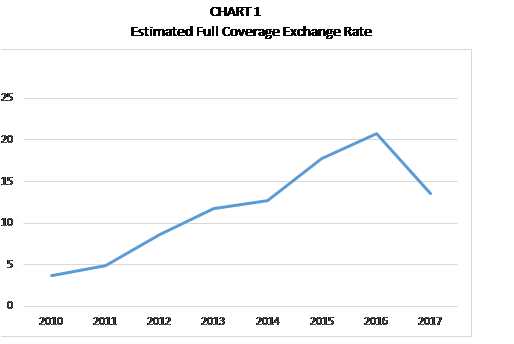 Cuba’s assets at BIS have increased by $1.5 billion in the six months to mid-2017, providing better reserve coverage and lowering the full coverage exchange rate from 20.8 in 2016 to a preliminary estimate of 13.5 (Chart 1). It is unlikely that authorities would want to proceed with unification at such a rate as the coverage ratio is only .24. International liquidity demands on Cuba remain high with reported arrears on payments to suppliers. There are policy options with continuing exchange controls on capital transactions and full or partial use of flexible exchange rates. However, until Cuba opens up access to international financial markets it remains a tough task to unify exchange rates while bringing substantial convertibility to the Cuban peso. [ii] “Cuba anuncia proceso para eliminar dualidad monetaria”. BBC Mundo, October 22, 2013. [iii] “Aunque la eliminacion de la dualidad monetaria y cambiaria por sí misma no solucionará mágicamente todos los problemas acumulados en la economía cubana, constituye el proceso más determinante para avanzar en la actualización del modelo económico por el impacto que tendrá en todas las esferas del quehacer económico y social de la nación. Sin resolver eso es difícil avanzar correctamente. “Raul en la Asamblea Nacional”, discurso de Raul Castro, cubadebate, December 22, 2017. [iv] Ernesto Hernandez-Cata, “ A Triumph of Intelligence: Cuba Moves Towards Exchange Rate Unification”. ASCE Blog, December 12, 2013. [v] ONEI, Anuario Estadistico de Cuba, Cuentas Nacionales 2015, Edicion 2016. [vi] ONEI, op.cit., Consumo final de los hogares por fuentes de oferta. [vii] Pavel Vidal, “Que lugar ocupa la economia cubana en la region? Banco Interamericano de Desarrollo. Resumen de Politicas No. IDB-PB-269, 2017. [viii] The black market varies around the after-tax value of the dollar. There is a 10% tax on dollar trades. [ix] For a monetary analysis of foreign exchange policy in Cuba see Gabriel Di Bella and Andy Wolfe “A Primer on Currency Unification and Exchange Rate Policy in Cuba: Lessons from Exchange Rate Unification in Transition Economies”. Cuba in Transition, Volume 18, 2008..
[x] Financial Statements of Banco Central de Cuba, December 31, 2012, Interaudit, Ciudad de La Habana. [xi] 2016 currency data is reported by CEPAL, Balance Preliminar de las Economías de América Latina y el Caribe ▪ 2017. [xii] A velocity parameter involving currency and CUP circulacion mercantil is used. [xiii] The exchange rate used in 2016 is 3.21, the same as in 2015.